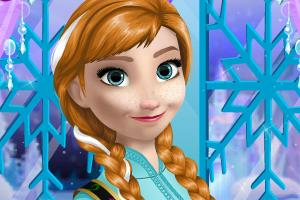 Disney Frozen Dress Up Game & Makeover Game. Do Anna'a Makeup. Anna is going out tonight with a handsome prince and she needs your help with her makeup. Princess Anna of Arendelle is so beautiful and fun character. Did you know that in the film Frozen she is voiced by Kristen Bell. Anna's character in the movie Frozen made by Walt Disney is based on Gerda who is a character from Hans Christian Andersen's fairytale The Snow Queen.